The longstanding FADER Mix series presents new, exclusive DJ mixes from our favorite artists. 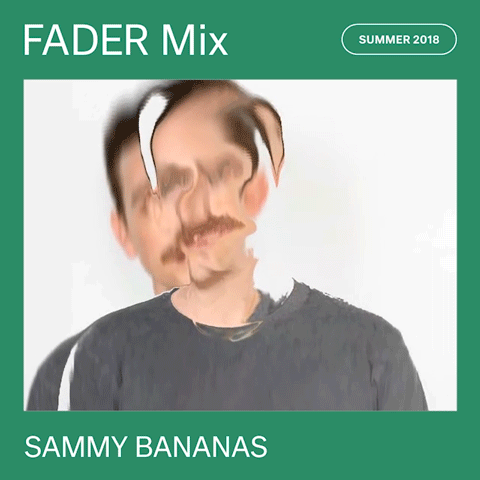 Brooklyn producer and DJ Sammy Bananas shapeshifts his way through dance music — over the past few years, he's tackled disco, house, and more. On Someday, his new release for Fools Gold, he offers bright, metallic club sounds matched elegantly with soul and R&B vocals. As a DJ, he has yet more range, as evidenced on his brand-new FADER Mix, an eclectic journey through a warm Brooklyn afternoon. Sammy is also a founder of DJs For Climate Action, a nonprofit group comprised of a wide range of musicians with the mission of using "their craft and cultural influence to raise awareness and provoke response to the global challenge of Climate Change." Tonight he'll play at Black Flamingo in Williamsburg as part of a monthlong residency benefiting Power Shift Network. Listen to his FADER Mix below and if you're in New York, consider checking out tonight's event. This is a soundtrack to sitting in the shade on a hot summer Sunday. I tried to make a mix in a similar emotional space as my new album Someday. My record rides this line between uncertainty and possibility with a general trend towards the hopeful, soulful and fun. This selection of tunes works to hit the same tone, though it's definitely more global. There’s lots of stuff that I’ve been listening to at home, as well as tracks I’ve been playing out. I picked this group of songs the night of Father’s Day after spending a truly magical day with my 2 year old riding around Brooklyn on my bike. I think it has to be “Bring U Up” by Romanthony. He’s probably best known (or unknown) as the singer on Daft Punk’s “One More Time,” but he has incredible solo records and I’ve only recently discovered this gem. It connects the dots between James Brown, Prince, and house music in this amazing way and is just funky as hell. I’ve been playing this every gig. Basement Jaxx, Evelyn Champagne King, but I’ve also been listening to a lot of Emmylou Harris and Americana recently. How did you get involved with DJs for Climate Action? What makes this event series significant to you? Around a decade ago I started flying a lot for gigs around the country/globe and it really got me thinking about my personal impact on the planet. Even if I try to eat local and hardly ever drive a car, I’m still going to spew too many greenhouse gasses into the atmosphere through those flights. I started DJs For Climate Action with annual offset drives encouraging other DJs to take stock of their air travel and balance that negative impact with donations to climate conscious projects. These days we focus on connecting DJs with opportunities to use their craft and visibility to generate action through shows and social media. Our residency at Black Flamingo this June is the first chance we’ve had to partner directly with a venue for multiple parties. We’ve been able to curate an amazing month-long lineup of varied DJs, and pair them to fundraise for different local non-profits each week. I love the idea of hitching awareness onto a club night, to use the energy within that experience to try and do something transformative. Look us up at djs4ca.com! Sammy Bananas plays tonight at Black Flamingo in Brooklyn, benefiting Power Shift Network.